We’ve been hard at work over the winter season to make your shopping experience the best it can be. Among plenty of new products, including our innovative and awesome new Designer Trunks with hundreds of available options, our Customer Service crew has made some excellent changes to our website to give our customer a more convenient and considerate store. At the beginning of the month, I announced that we launched our Mobile Site. Today, I introduce our new Shop-by-Brand feature. Find this handy feature directly below our ‘Most Popular Picks’ on the homepage of our website or under the main menu options in the top left corner of our mobile site. When you want to shop just a single brand, click the Shop-by-Brand feature for direct access to a page that lists our brands. Our online store is laid out by departments—our selections of ‘Camping Gear’, ‘Name Labels’, ‘Travel Accessories’ and five others. But the Shop-by-Brand feature is for times that you only want to look through Columbia clothing or Kelty sleeping bags as opposed to perusing our entire selection of boys and girls apparel or our plethora of sleeping bags. 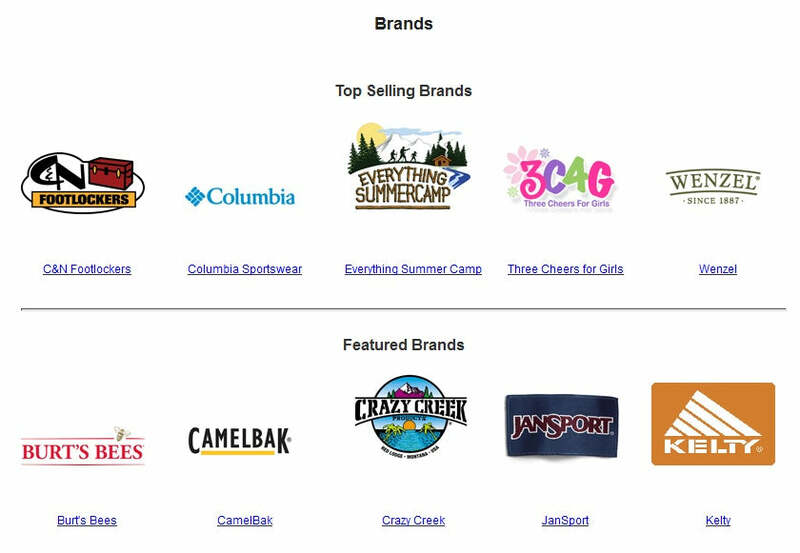 Please note that not all of the brands we carry at Everything Summer Camp are represented in our Shop-by-Brand feature. Criteria to meet for Shop-by-Brand membership relies on A) how many products we carry of a particular brand B) how popular they are among our customers. We included a lot, featuring just shy of 70 brands in this new website feature. In closing, I invite you to check out our Shop-by-Brand feature to shop exclusively the brand you’re interested in and read our brief summaries of our brand overviews and histories. Enjoy your shopping our website and, as always, thanks for reading.